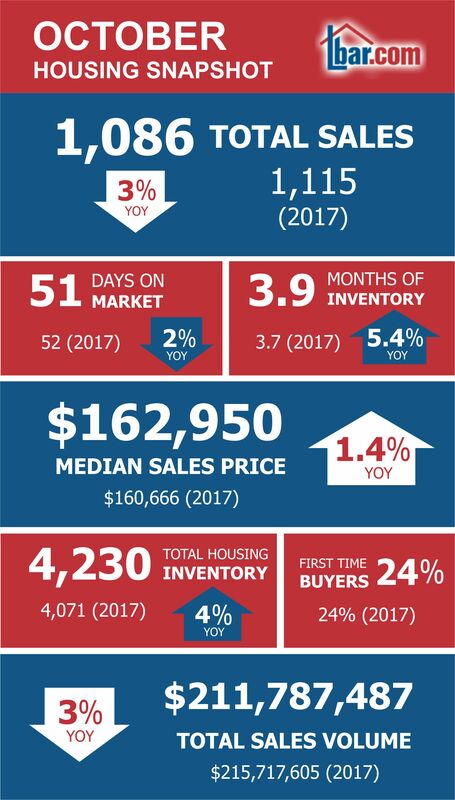 LEXINGTON, Ky. — Real estate sales by members of the Lexington-Bluegrass Association of Realtors (LBAR) rose 7.5 percent in October 2018 from the previous month (1,086 versus 1,010) but were down slightly compared to the same month a year prior when sales were 1,115. On the national level, median prices were up 3.8 percent in October, reaching $255,400 in 2018 and marking the 80th straight month of year-over-year gains. Unsold inventory hit 3.9-months of supply in October, up 5.4 percent year-over-year. Months of inventory is down from September when it stood at 4.3 months. Nationally, months of inventory is tracking than what is being seen locally with a 4.3-month supply, down from 4.4 the prior month and up from 3.9 months for the same time the previous year. As the region’s leading advocate for homeownership, Lexington-Bluegrass Association of Realtors understands the value and joy of owning a home. LBAR represents more than 3,300 realtors located in Anderson, Bath, Bell, Bourbon, Clark, Clay, Elliott, Fayette, Franklin, Harrison, Jackson, Jessamine, Knox, Laurel, Menifee, Montgomery, Nicholas, Powell, Rowan, Scott, Whitley and Woodford Counties. Visit www.lbar.com for up to the minute real estate listings and buying and selling resources.